The 2017 crash that claimed the lives of Corbin Yaeger, Randy Yarnell, and Kelley Williamson has resulted in the Yaeger family filing a lawsuit against TWC for $125 million. I have read parts of the filings and I don't see how they DON'T get every cent of that $125 million. 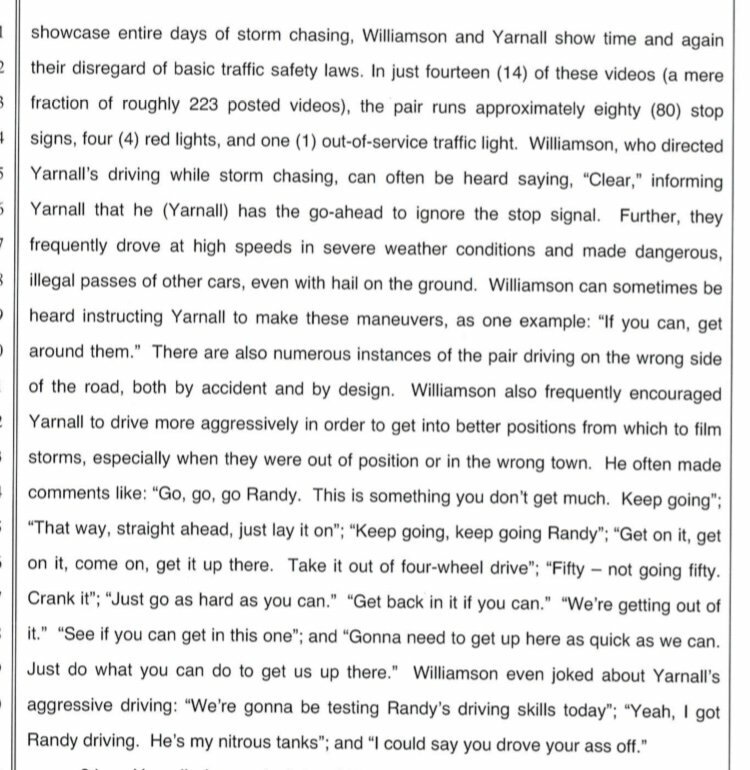 They have went through hundreds of chase videos and documented series of egregious disregard for traffic laws by Williamson and Yarnall. I think this will permanently change the chase community as many news stations will opt NOT to have that liability and not employ their own chase vehicles (see ABC 33/40). It amazed me how quiet TWC was after announcing Randy and Kelley had died in an accident. There was no more mention of them, their show was pulled and no tributes made. I feel like even then they knew they would be facing a lawsuit. I really liked watching Randy and Kelley on the livefeed on YouTube, I’d Norbert a follower for more than a month so I didn’t notice how reckless they were or I wouldn’t have respected or followed them. They drove through Alabama down I-65 chasing a week or less before their deaths. They stopped in Jemison, AL to watch a rotating cell, people came out to talk to them, they were just as friendly and down to earth as can be. However, they basically murdered a young man with a vehical and that could have been prevented had they not had the attitude of being above traffic laws. This is a senseless tragedy and I’m surprised it doesn’t happen more often with other irresponsible chasers in the field! That depends. Did Yaeger also drive in the same manner. If he didn't and the family can prove that Yaeger stopped before being hit, then this is open and shut. But if Yaeger drove in a similar reckless manner ( I am not saying he did as I do not know enough about Yaeger) then the case will be harder to prove. Yeager had the right of way on his side. I believe it was estimated through crash forensics that Williamson and Yarnell blew through a stop sign going over 70 mph. And because of their shear wrecklessness, he couldn’t do everything in his power to prevent the wreck. This was bound to happen. The storm chasers fighting to get the best shot and sell their footage have gotten greedy and reckless.